I had no intention of hitting on this this week, but it’s fresh on my mind after a few conversations I had. I might have written about this somewhat in the past, but I think it bears repeating. Today I want to talk about why I don’t talk much in numbers anymore when it comes to engineer-speak. This week Slate Digital released their first Audio Legends course featuring a mix done by Chris Lord-Alge. As some of you know, CLA’s mixes have been an influence and inspiration for me for quite some time. I’ve seen and read a lot about his process and methods, but I was eager to check this course out because it comes with a Pro Tools session CLA actually mixed. I’ve gone through a lot of console show files from other engineers over the years, and these have been very informative. However, it’s something completely different when you have an engineer’s “show file” along with audio to pass through and their moves playing back in real time. If you’re familiar with any of CLA’s interviews, you’re probably familiar with his approach that typically involves very little use of subtractive EQ. CLA is a booster, and this is one area where we differ on approach. 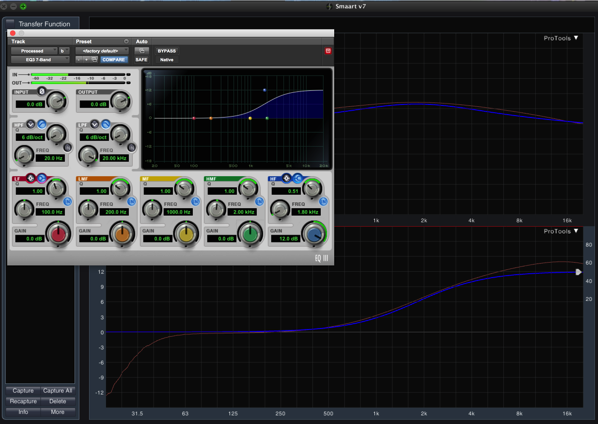 I’m not afraid to boost, but I like to use it in conjunction with subtractive EQ. Looking through some of CLA’s EQ’s in the course reminded me of a couple of things, so let’s take a look at something CLA is known for: his snare drum. You can see exactly what CLA is doing to the snare in a video from the course HERE. After hearing the results, I was curious what’s actually going on so I took the plug-ins CLA is using for EQ and his settings and ran it through Smaart. Here’s what I measured. 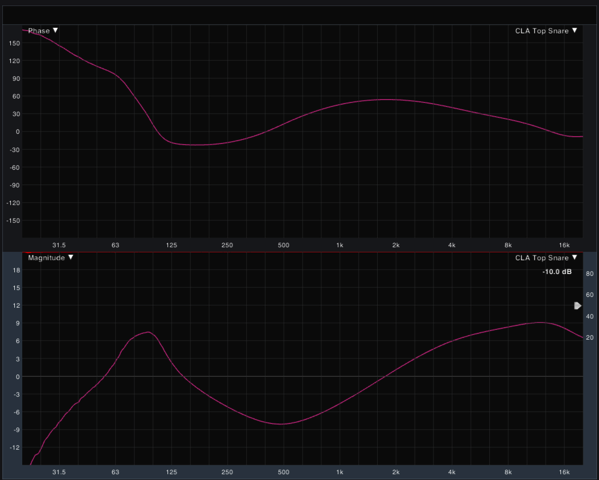 The top pane is phase, but we’re going to be most interested in the bottom one which is the EQ curve processing things. Not so much boosting now, right? Interesting, right? As Mr. the Lord-Alge says, there’s no wrong way to get a sound. Now, personally I believe using strategic subtractive EQ in live sound and mixing can be a better practice than just boosting things, but that’s not the point of this article. What I find interesting is CLA has been an influence on me over the years, so it’s not really that surprising to me that I’ve been EQ’ing snare drums along similar lines, although, I’ve been getting there from a little different path. In full disclosure, though, I dialed the EQ above in to get close to the shifted CLA curve to make this point, however, if we pulled up some of my old show files I have no doubt you’d see something extremely similar happening to my snare drums. This leads to the point I do want to make with this. At the end of the day, what we hear is all that matters. It’s not whether we cut or boost at X frequency. There’re pro’s and con’s to turning the knob either way, but at the end of the day what we hear is what matters. I listened to CLA snare drums for many years, and they heavily influenced the drum sounds I figured out how to get from using my ears. Talking to other engineers and looking at their approaches can, I believe, be educational and informative to give you ideas to try which is why the Audio Legends course interested me, but copying things outright is, in my opinion, a dangerous route to take. 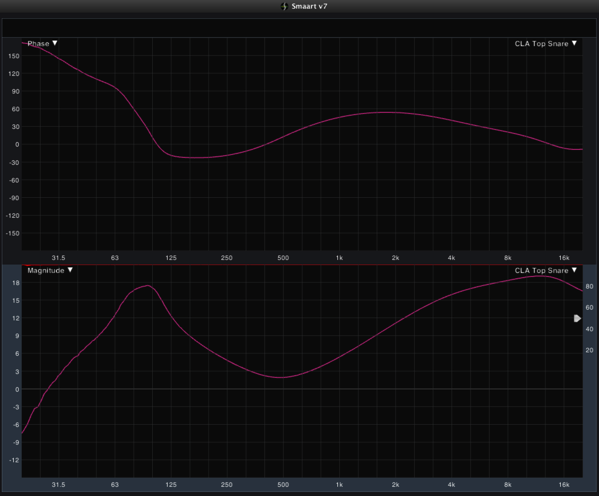 This is the Slate FG-S plug-in with a shelf set at 8 kHz doing a boost of about 13 dB. The FG-S is Slate Digital’s take on an SSL style EQ similar to what CLA uses. In CLA’s world, a move like this would not be unusual, and I’m sure he’s talked about doing something like this in interviews in the past. 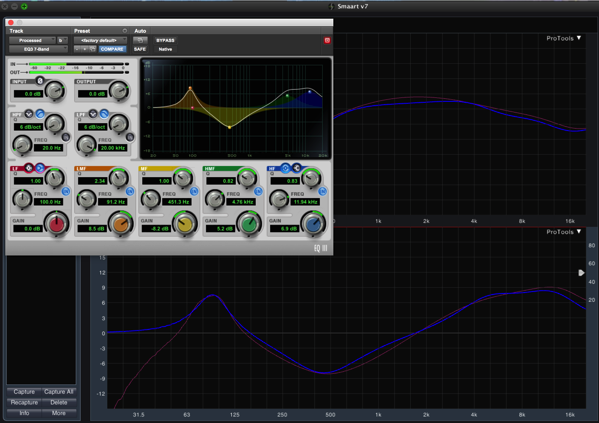 The blue curve here is the EQ3 plug-in which is, for all intents and purposes, the same EQ on VENUE consoles. 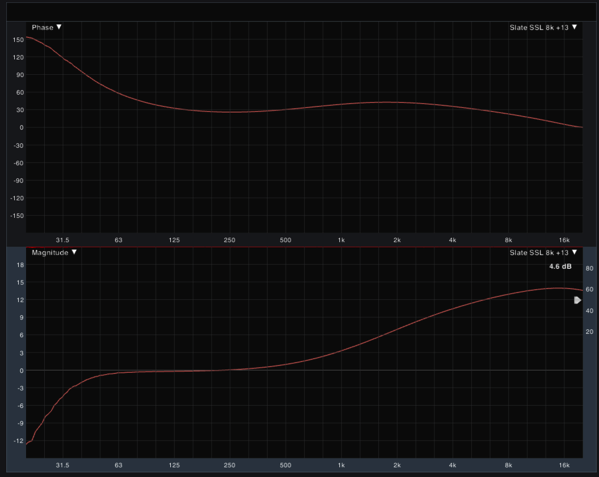 Notice how similar the curve is to the Slate curve, but take a close look at the frequency: the EQ3 plug-in’s shelf is set to 1.8 kH! If I used the default shelf setting at 8 kHz on the EQ3 plug-in, we would see and more importantly HEAR something completely different than what Chris Lord-Alge might talk about doing with a shelf in an interview. This is a big part of why I don’t get hung up on numbers when I’m mixing anymore. One man’s 8k could be another man’s 2k depending on the gear being used. On most modern digital EQ’s I find the frequencies listed are generally pretty accurate, however, on some of the older, vintage stuff they might not equate. These days I much prefer to use words to describe frequency areas such as upper-mids, low-mids, lows, etc. instead of talking specific frequencies. To me, these connect better to how we listen and perceive things than specific numbers. In live sound, there are advantages to learning frequency numbers by ear for the purposes of system optimization and dealing with feedback. In these situations, accuracy makes a difference. But when it comes to mixing, I’m typically more interested in tones than a specific frequency, and that often means broader strokes. So when you sit down to mix use your ears and turn the knobs–if necessary–’til it sounds right. Our ears can’t count. They only listen. Thank you for this very interesting article. Your blog is always an inspiration for me. In live sound, I often prefer to cut, rather than to boost. In a studio environment you have very musical EQs like the Slate Digital ones or other Wave plugins. Those EQs sound very good when boosted, they even add some harmonic coloration to the track, that might be beneficial. 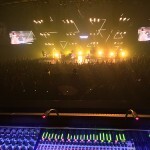 In live sound, however, I often have only one EQ available, the stock EQ of the console. And unless you have the privilege to mix on a very expensive console, those EQs tend to sound odd when boosted in high amounts. Therefore: On an average live console, I will always prefer to cut, rather than to boost, but not so in the studio world.